The square had always been a lively place; today it is a popular part of the town for both Czechs and visitors from abroad, and offers plenty of restaurants, pubs, shops, entertainment, galleries and museums. Its long history goes back to the 11th century when the square formed the crossroads of several long-distance trade routes and served as a marketplace. It was known across the whole of Europe at that time. While sitting at some outdoor cafés or strolling around you will not miss the view of beautiful pastel-coloured buildings of Romanesque or Gothic origin with fascinating signs. 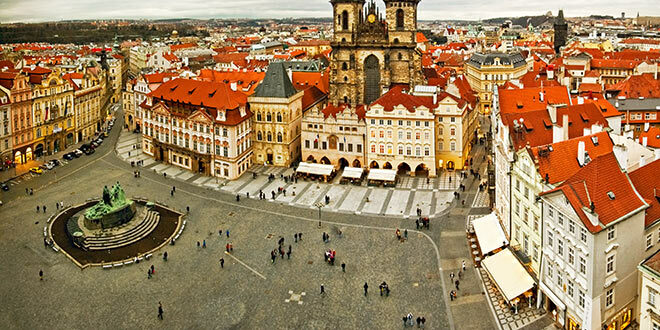 The most notable sights here are the Church of our Lady at Týn and the Astronomical Clock Tower. 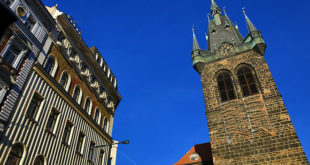 The tower is now part of the town hall which was founded in 1338 while the Astronomical Clock dates from 1410. The clock is a very entertaining tourist attraction – watch twelve apostles appear every hour from 9am to 9pm in its upper section. The historic rooms of the town hall, a tower and a Gothic chapel are open to the public. 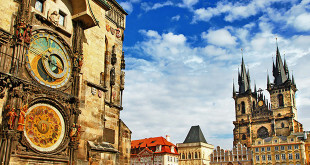 The Jan Hus statue is the centrepiece among a variety of surrounding historical buildings. The statue was erected on 6 July 1915 to mark the 500th anniversary of the reformer’s death. The groundswell of supporters for his beliefs during the 14th and 15th centuries eventually led to the Hussite wars. Despite the initial outcry at the modern style of the sculpture the statue stands as a symbol of Czech identity.